This Browsers is absolutely great and highly recommended. Keep in mind you are never truly anonymous regardless even while using flushes, IP cyclers, tunnels, proxy's, Etc. For those trying to dodge IT at work from watching/tracking them here are sime additional tips. For people trying to dodge the at work limitations of the IT department blocked / tracked browser/URL website, IP tracking. An additional tip is to install linux operating system on a thumb drive have your browser also within that running off the linux OS. You can run your normal windows operating system but also have a VM(virtual machine) running the linux OS and do all your personal browsing from that using any browser. Utilizing that will hide ALL IP/URL’S (website traffic) and will only display 1 IP in layman’s term: its your base original computer IP which is like a name or ID nothing to be concerned about. Keep in mind that your IT department can also VM into your machine at any time if setup which most companies do. What that means is they can see a mirror image of what you have on your screen/monitor in real time. Another way to do the anonymous (to an extent) browsing is setup a RDP with your home computer and login to it from work. Some believe keeping task manager up watching processes/services they can tell when IT is viewing(the mirror image of your display i spoke about) however, isn't true for all cases VMware and some other software have a constant non terminable process and doesn't change when IT remotes in. You can make an educated guess by monitoring CPU usage, physical memory usage %, local/wireless connections usage % Monitoring network these will typically significantly spike when IT remotes into your desktop again its an educated guessing game. You can avoid the IT dept. remote viewing if you just bring you own laptop bot company issued to work but if using there internet you still beed to do the linux thumb drive solution or something of the sort to get around tracking and blocked domains(URL websites) but you don't need to worry about IT remotely viewing your live desktop and actions. Secure and fast web surfing the only thing it shuts off ! Then I turn it back on. Please fix this ! 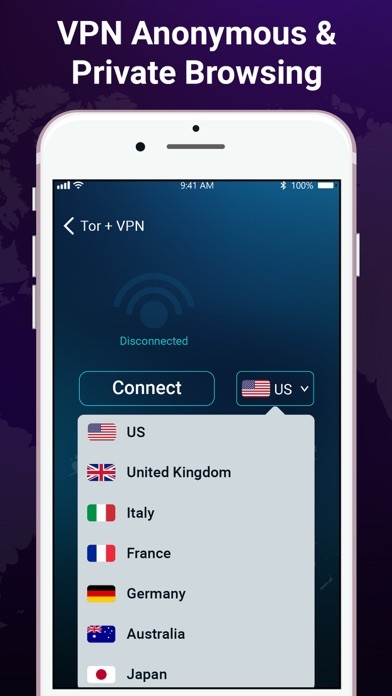 The app is great quality but the price is outrageous, it's not officially supported by tor ether so none of the money goes to improving/ maintaining the experience. It's an obvious con.